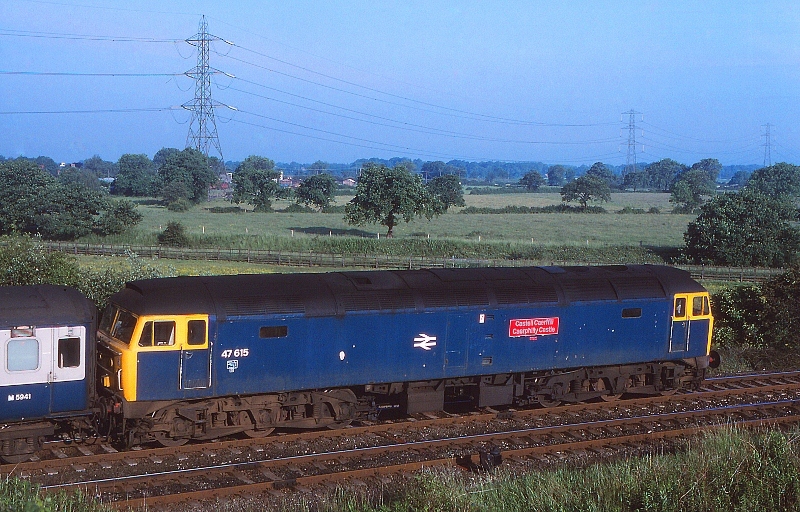 Martyn Hilbert's Railway Photography - Preston & District - Class 47, 47615 on Farington Curve. Class 47, 47615 on Farington Curve. On a throwback to the old 'Wakes Week' Holiday Trains of the past, Class 47, 47615-'Caerphilly Castle' drops down Farington Curve with the Saturday Only, Rose Grove to Paignton Service on the 11th August 1988. The 47 will work the train to Preston, where an AC electric locomotive will take over for the leg to Birmingham New Street.